Dinosaur Comics - February 3rd, 2014 - awesome fun times! February 3rd, 2014: Hey you know what happened on Saturday? 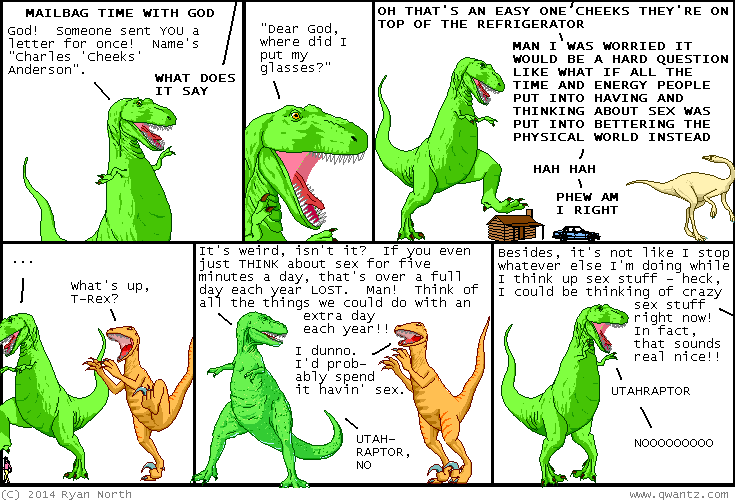 Saturday was February 1st 2014 ALSO KNOWN AS the eleven-year anniversary of Dinosaur Comics! Is that not nuts? It is ENTIRELY NUTS. When I started Dinosaur Comics on February 1st, 2003 I thought the comic would last a month, and at the end of that month I'd change the template to something involving astronauts. But then I ended up liking T-Rex and Dromiciomimus and Utahraptor and thought, "okay, maybe I'll change templates every two months instead of every month". And now here we are 11 years later! The moral is: changing templates is a lot of work that can be easily postponed, THE END.